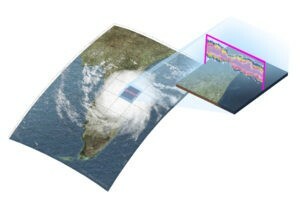 within each grid cell (right) of the global climate model. Severe weather events, such as storms and tornadoes, that can lead to flash flooding, power grid blackouts, and property damages are driven by the physics of convection as warm air rises and condenses, forming clouds. By simulating convective storms at a high-resolution of one kilometer, or less than one mile, scientists can improve predictions of regional water cycles that directly impact the U.S. economy through disaster preparedness, agriculture, and energy production. However, to accurately model clouds and precipitation at local scales, scientists need exascale computing power. Using GPU accelerators, researchers are designing a high-resolution, cloud-resolving model that can be integrated with regional and global climate models and compute the feedback between land, ocean, ice, and atmosphere—all of which are closely linked and affect the conditions for cloud formation. 06/30/17 Severe weather events are driven by the physics of convection. By simulating convective storms at a high resolution of one kilometer, scientists can improve predictions of regional water cycles.